“Hey, look! A Hawaiian license plate!” a little boy said while pointing at our Xterra. 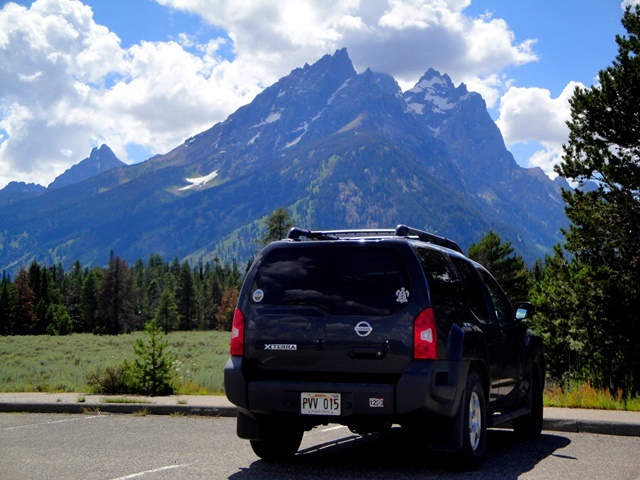 We had just parked at Grand Teton National Park in Wyoming when we overheard the conversation. It wasn’t the first time we heard that excited statement on this trip. The license plate game is a popular road trip past-time here in the U.S. It’s not surprising that the Hawaii plate is such a sought after prize. We were on our way to Seattle moving from Honolulu where our journey with the Xterra began. In the summer of 2008 we were in need of an SUV that could handle our active lifestyle; hiking, backpacking, scuba diving, surfing, kayaking and camping. We bought the Xterra brand new there in Hawaii with about 20 or so original test miles on it. One of the first memorable trips we took it on was to Maui that August by way of the now defunct Hawaii Superferry. On that trip we drove up to the top of Haleakala Crater for an amazing backpacking adventure into the moon-like landscape of the crater. It was an incredible trek and one of my favorites. About a year later in the summer of 2009 we bid farewell to Hawaii and started our journey to Seattle. We loaded the Xterra on a container ship bound for Long Beach, California where our road trip began. We had a few weeks before we needed to get settled in to our new home state of Washington, so we planned an adventure through some of the Western States. Instead of driving straight north to our destination we headed east out of LA towards the bright lights of Las Vegas, Nevada. Along the way we camped and hiked at the breathtaking Grand Canyon in Arizona and learned why Utah rocks by visiting several of its National Parks like Bryce Canyon, Canyonlands, Capitol Reef and Arches. We then drove north into Wyoming and Montana to explore Grand Teton and Yellowstone National Parks and on into Idaho before reaching our new home state. It was an amazing trip where we explored as much of the western states that time would allow. By the time we arrived in Washington we had driven through 9 states. While living in Seattle, in addition to exploring much of the state, we made several weekend trips to Oregon as well as a longer road trip down to Northern California through the Redwoods and on into San Francisco. While in the Pacific Northwest the Xterra also gave us the opportunity to venture north into British Columbia, Canada to Vancouver, Whistler and Vancouver Island. We had a number of amazing trips to our northern neighbor. Four wonderful years later, we planned yet another road trip, this time to the east across America with a move to North Carolina. While there was so much we hoped to see on this cross-country journey our time was limited. Our first planned stop was at Glacier National Park in Montana. The sharp mountains, cliffs and glacial lakes were truly spectacular! Just after visiting the site of Little Bighorn Battlefield in Montana the Xterra’s odometer hit the 100,000 mile mark. Turning up the music we celebrated and reminisced about all the great adventures we have had together in the Xterra and vowed to make the next 100,000 just as fun. I think it’s quite an accomplishment! After several pictures (while going 80 mph) we continued on to the east into Wyoming. Our next stops were Crazy Horse Memorial and Mount Rushmore in South Dakota. Crazy Horse is still a work in progress, and is scheduled to take many more years to complete. Once finished it is expected to be the world’s largest mountain carving and dwarf nearby Mount Rushmore Monument. I still think the carvings of Washington, Jefferson, Lincoln and Teddy Roosevelt at Mount Rushmore are very impressive and worth a visit. After Mount Rushmore we continued east in the Xterra through Rapid City and on into Badlands National Park. The summer heat was extreme and we were happy that our air conditioning was working well. The stark contrast between the green grassy prairie and the vibrant yellow and red hills is breathtaking. To the east Minnesota and Wisconsin were next. I showed Josh the small town where my father grew up near the MN-WI border and the Mississippi River. It had been ten years since my last visit when the family gathered for my grandmother’s memorial service. In town we found the old swinging bridge over the creek where I would play with my sisters and the house where my dad grew up both still standing. It was a sweet stroll down memory lane. That evening we stopped for the night in Madison and visited with my cousin. Early the next morning we were off once again into Milwaukee to check out a few breweries and a Brewers baseball game. It was a fun night partying with new friends. We heard deep dish pizza calling our names so our next stop was Chicago, Illinois. With our bellies filled we began to grow anxious to reach our destination so we speeded past the Indianapolis Motor Speedway in Indiana and on into Kentucky. We couldn’t resist a quick side-trip to Lawrenceburg for a tour of the Wild Turkey Distillery. We then breezed through Tennessee before finally crossing the North Carolina state line hitting the Xterra’s 18th state. After settling in to our new home in NC we had some time left before starting work and made the drive up north to see Josh’s family. We had driven this route many times before but this was the first with the Xterra. Virginia, Maryland, Pennsylvania and our 22nd state; New York were added on this trip. An overnight drive put us in town just in time for breakfast. The ten-hour trip seemed short when compared to our drive across the country. On a recent trip south to visit more family for Thanksgiving we added three more states South Carolina, Georgia and number 25; Florida to the list. Our new pup Lager joined us for the trip this time and he handled the long drive like a champ. You can see all the states highlighted in the map below. Florida will not be the last new state our Xterra will venture through. It has been an incredible journey so far with now over 138,000 miles behind us and we know there will be plenty more to come. Posted by jingerventures on January 19, 2015 in All adVentures, California, East Coast, Hawaii, Midwest, Pacific Northwest, Southwest and tagged adventure, Badlands National Park, Camping, Glacier National Park, Hawaii, Lager, Mount Rushmore, National Park, North Carolina, Oregon, Road Trip, Scenic, Seattle, Southwest, Travel, Utah, Washington, Wyoming, Xterra.